11 Function Credit Card Size Survival Pocket Tool 2 Pk Only $1.90 Plus FREE Shipping! You are here: Home / Great Deals / Amazon Deals / 11 Function Credit Card Size Survival Pocket Tool 2 Pk Only $1.90 Plus FREE Shipping! 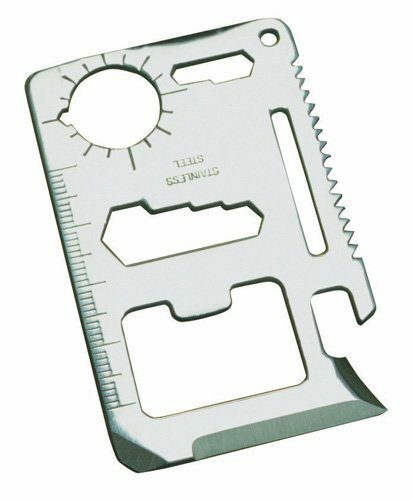 Made from extra durable stainless steal, this credit card size multi-tool fits in your wallet! The 11 Function Credit Card Size Survival Pocket Tool 2 Pk Only $1.90 Plus FREE Shipping includes a can opener, knife edge, screwdriver, ruler, cap opener, 4-position wrench, butterfly screw wrench, saw blade, direction ancillary wrench, 2-position wrench, and a keychain hole!